What Awful Things Happened in Syria Last Night? You may have noticed that something terrible happened in Syria last night. The White House accused the country's military of having "murdered hundreds of Syrian citizens, including women and children" in what many are calling the most violent government assault in the almost 11-month-long uprising. 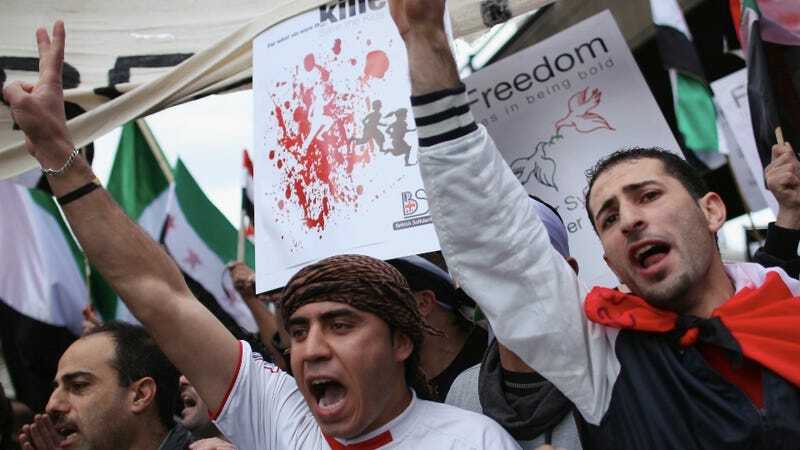 A number of human rights groups are reporting that upwards of 200 Syrians were murdered and many more were wounded in an attack that began when Syrian Army defectors attacked two military checkpoints and abducted around a dozen soldiers. The military commanders retaliated, big time, from about 9 p.m. Friday to 1 a.m. Saturday, mostly in Khaldiya and five nearby neighborhoods. The Syrian government claims, as it has throughout the past year, that "life is normal" in the country and that the media is "fantastically exaggerating" the casualties. The toll is basically impossible to confirm, since Syria won't let journalists through its borders. But first-person reports and videos depict a truly monstrous scene. "It's a real massacre in every sense of the word," one Syrian told the New York Times. "I saw bodies of women and children lying on roads, beheaded. It's horrible and inhuman. It was a long night helping people get to hospitals." As one would hope, most countries are horrified by last night's events. President Obama said in a statement that President Bashar al-Assad "has no right to lead Syria, and has lost all legitimacy with his people and the international community." French foreign minister Alain Juppé called it a "crime against humanity" and vowed that "those responsible will have to answer for it." Today, protestors stormed Syrian embassies around the world, in some cases tearing off embassy gates and destroying property. The United Nations Security Council met soon after the assault in hopes of coming up with a solution, and thirteen members, including France, the United Kingdom, and the United States voted in favor of a proposed Arab League peace plan, but Russia and China vetoed the measure on the grounds of imposing on Syria's sovereignty. Members tried to work out a compromise with Russia, Syria's main ally (and, in a total coincidence, major weapons provider), beforehand, but it didn't go so well: Sergey V. Lavrov, Russia's foreign minister, said his country rejected the final resolution because "it did not place sufficient blame for the violence on the opposition" and it "unrealistically demanded that the government withdraw its military forces back to their barracks." U.S. Ambassador Susan Rice said the United States was "disgusted" by the veto. "This intransigence is even more shameful when you consider that one of these members continues to deliver weapons to Assad," she said, referring to Russia.